For the first time ever K and I are working together on a review. 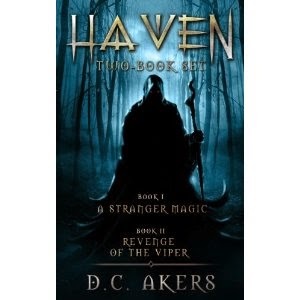 He was given the Chance to review the book Haven By D.C. Akres. 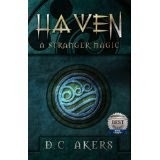 I found this book very slow to get going but once the action started I seriously got into it. The main Character Sam and his BFF Travis going to school and Sam's older sister Sarah being a typical older sister giving them a hard time. Then things start to happen and Sam and Travis find things that they never thought could ever happen. What did you think K? I thought the same thing mom. But, the strange things were magical. But, the boys thought that it was only them that the magic things happened to. That is true the sister it was revealed earlier that she could control water with her emotions. We both think that this book ended in a bad spot. In the last chapter of this book 2 new characters were introduced. We think that the first couple of chapters from book 2 should be moved to book 1. On to book 2. 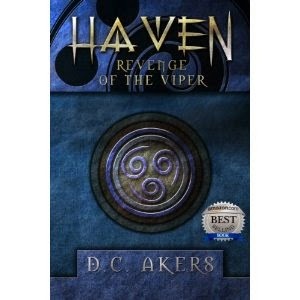 This one is called Haven: Revenge of the Viper and it is $3.99 on Amazon here. This book is a continuation of the first book and brings everyone involved in the first book together. Like you get to figure out who the mystery man is and more about Sam's mom and his deceased father. You learn who the Vipers are and who or what they are after. You learn what the deal with the spiders was from in the first book. I struggled to get through the first book but when I started with the second I was hooked. I agree with you mom. What I want to know is how Sam picked up a sword that should have killed him instantly but it didn't why? I wish I knew K I guess we'll just have to wait for the 3rd book. I mean they just made it to Haven and Sarah is hurt critically. The book left us hanging and desperate for more. As frustrating it is for us it is great for the author. So that is it for us besides this Plea to D.C. Akers to finish and release the 3rd book soon!!! These books are also available as a 2 book set for $4.95 from Amazon here. The tandem review is a really great idea! I love it!